Dublin. GeWeTe excels in providing the right solution for every application. The gaming and amusement industries are multi-faceted and there is for sure no solution that fits all needs. GeWeTe prides itself on its closeness to the markets, thus being able to develop new solu-tions to further bolster its extremely strong product range. The GeWeTe has recognised the trend for younger players to enter gaming premises with only cashless methods of payment in their wallets or purses. The Cash Recycler allows such guests to purchase a ticket to play using chip, magnetic stripe or contactless cards. “We pur-posely wish to offer our customers all card payment methods as the market is diverse and only offering contactless, for example, may prevent some people from playing”, explained Aristidis Tsikouras, Managing Director of GeWeTe. 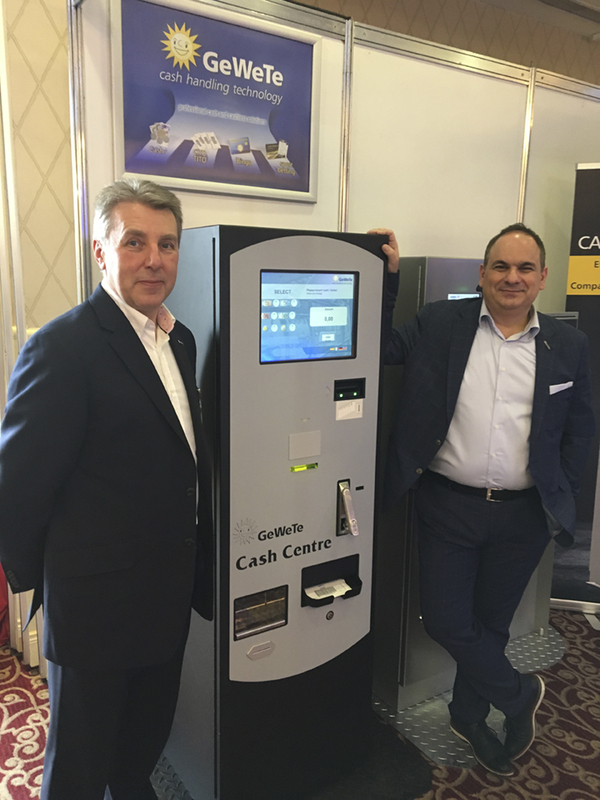 The most popular solution for the Irish gaming market from GeWeTe is the Ticket Redemption Solution Cash Centre Compact – Casino. Equipped with a large 15” touchscreen for simple use by both customers and operators, this includes coin acceptor, banknote recycler, card reader, barcode scanner and thermal printer which all ensure that all payment bases are cov-ered. The Cash Centre Compact – Casino can also be used as a bill breaker as the banknote dispensing capacity is covered by up to four cassettes offering the storage of up to 12,000 notes. Customers in Ireland and the UK are supported directly by the team at GeWeTe UK, headed up by Mark Edmundson. Mr. Edmundson commented, “The Irish Gaming Show is a great op-portunity for us to meet our customers here and provide detailed information on our product range to all the visitors to our stand. We also brought our amusement change machines – that can change banknotes to coins/tokens or coins to coins/tokens. Here we also cover many ba-ses – depending on the change requirements with the larger WGS170 and the smaller WGS102. For us it is all about ensuring that our customers have the right solution for their individual applications”. GeWeTe is celebrating 25 years in business this year. Mr. Tsikouras concluded, “As the change and redemption machine company within the Gauselmann Group, we are proud to have produced well over 60,000 machines throughout the years. We remain very focused on providing the right solutions for each market segment. We manage all the development, pro-duction, sales and support processes ourselves. This enables us to react very quickly to changing market needs. At the end of the day, we believe that we are the most economical provider in this market. Quality counts – less maintenance needs – more machine uptime. All these things go together to make GeWeTe the right choice for change and redemption ma-chine requirements each and every time”.